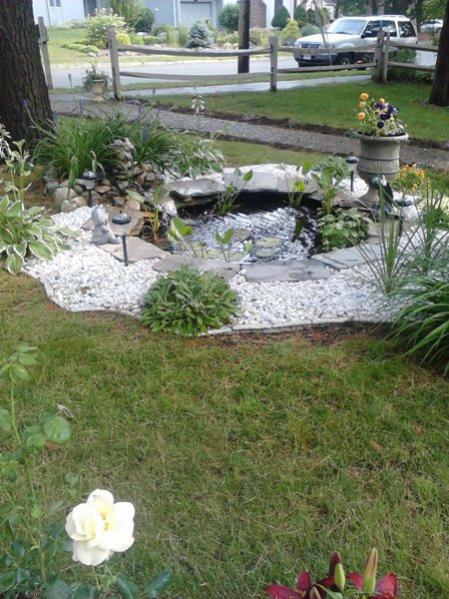 I dug an old stump out and instead of makeing another rock garden, i installed a water feature/pond..
evrything in it is a derivative of the original planting/stocking.. 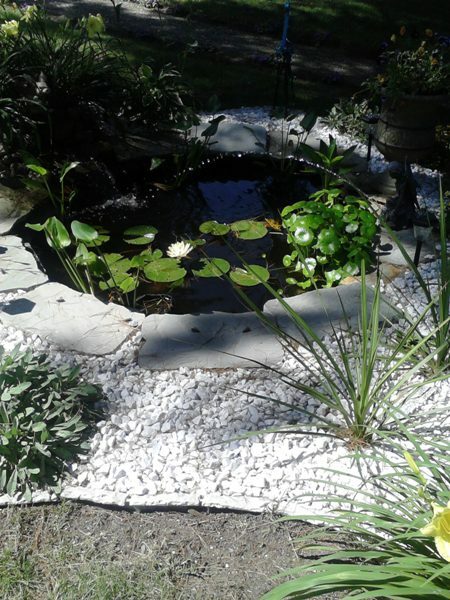 I try and maintain 12-14 fish... when the fish out grow the pond, I give them to my son inlaw for his HUGE pond..leaving the "seed" that has hatched the prior year....I ocasionaly "trade" fry with other pond keepers in the area so I can keep the "in breeding" to a minimum.. 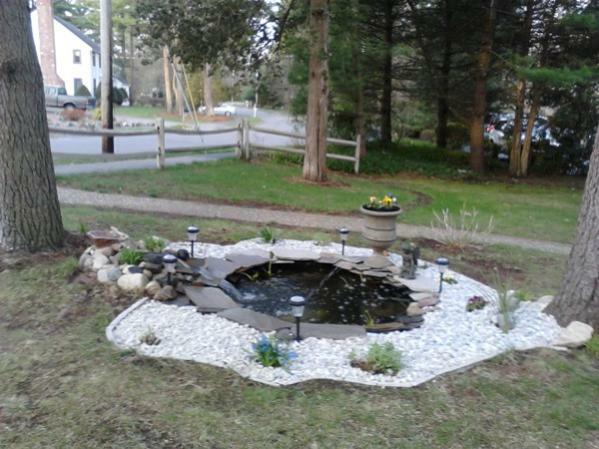 Such a sweet little pond! I love it - it looks like right at home by your garden! 10 years and counting - that's amazing to me! Who lives here? You mentioned that there are 12-14 of them, but did I miss what they are?! Looks like baby goldies!? Thanks for sharing your pics! 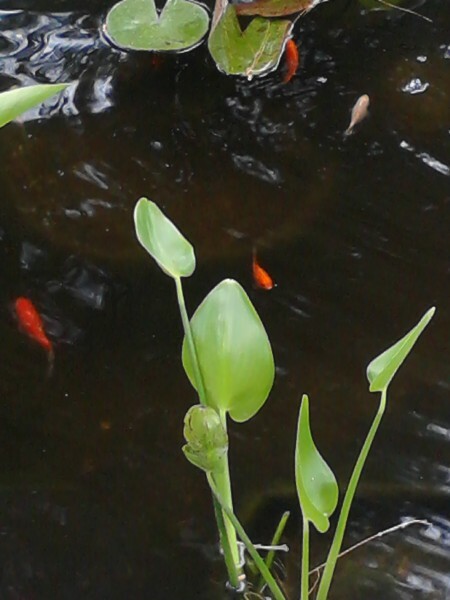 I never did mention what they were... they all started as "feeder" gold fish because i wasn't sure if the pond would make it in the pine forrest ( I have since cleared lots of branches so my lillies will bloom) ... I joke to everyone that stops by and admires the pond that they are "rescue" gold fish... they are mixed sizes from fry all the way to Louie... there is one "grandpa" fish( Louie) that is from the original stocking that is about 10" long.. every spring I expect to find him dead... and he takes food right out of my hand.. he only comes to the top when he see's people... of coarse people means food.. he is a P....I....G.. pig!.. he no longer can fit in the 3" PVC tubes i put in for them to hide in... so I made a tunnel from rock and the plants that I move to the middle for winter so he can be comfortable...I'll cry when he passes..
Neat, just neat! I can imagine that you must be very attached to him by now! You'll have to see if you can convince him to pose for his picture one of these days at feeding time, I'd love to see the granddaddy of them all! And I KNEW that! lol. . . it's so sad to shut down for the winter, neh? Well. . . you'll just have to promise to stick around until spring heads our way again! LUCKY US! I'll be here in the spring ( unless I croak or something)... I've got a salt water tank to build! this is what it looks like a few weeks after i open it up in the spring... perrenial flowers steal the show.. at least the water fall is easy to see..